This gorgeous pink and purple stone bracelet is made from mother of pearl, amethyst, rhodochrosite, and pearl. The centerpiece of the bracelet is the mother of pearl that has been carved into a unique rose shape. 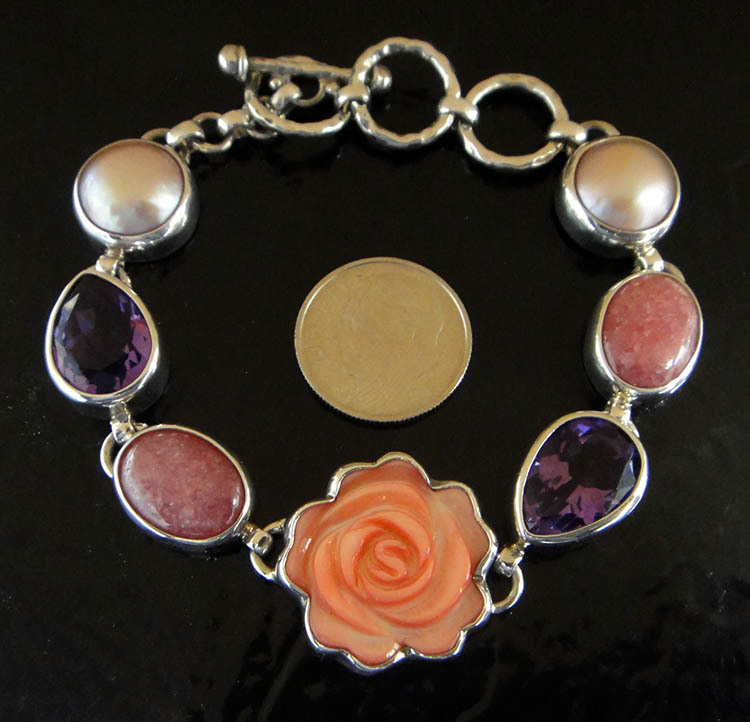 This gorgeous pink and purple stone bracelet is made from mother of pearl, amethyst, rhodochrosite, and pearl. The centerpiece of the bracelet is the mother of pearl that has been carved into a unique rose shape. 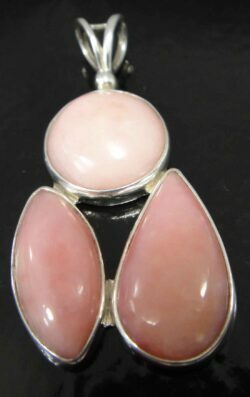 The three stones on each side of the rose are rhodochrosite, amethyst, and pearl. 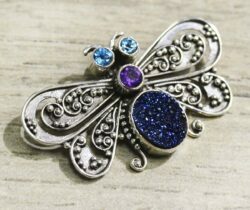 All metal used in the bracelet is .925 sterling silver. 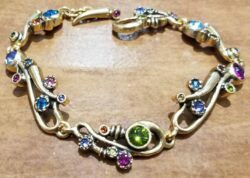 The bracelet utilizes a toggle clasp that can be worn at three different lengths to fit most small to medium sized wrists. 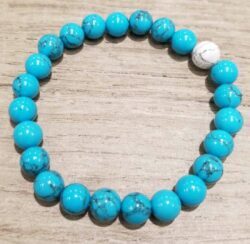 The bracelet can be adjusted in length from 6.25″ to 7.25″. 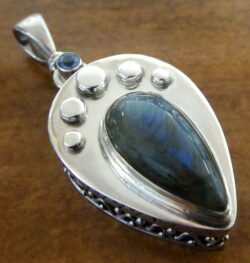 The widest point of the bracelet, the centerpiece, measures to be approximately 0.75″ across. Please note that the dime is not included, but it is shown to help you gauge the size of the bracelet. 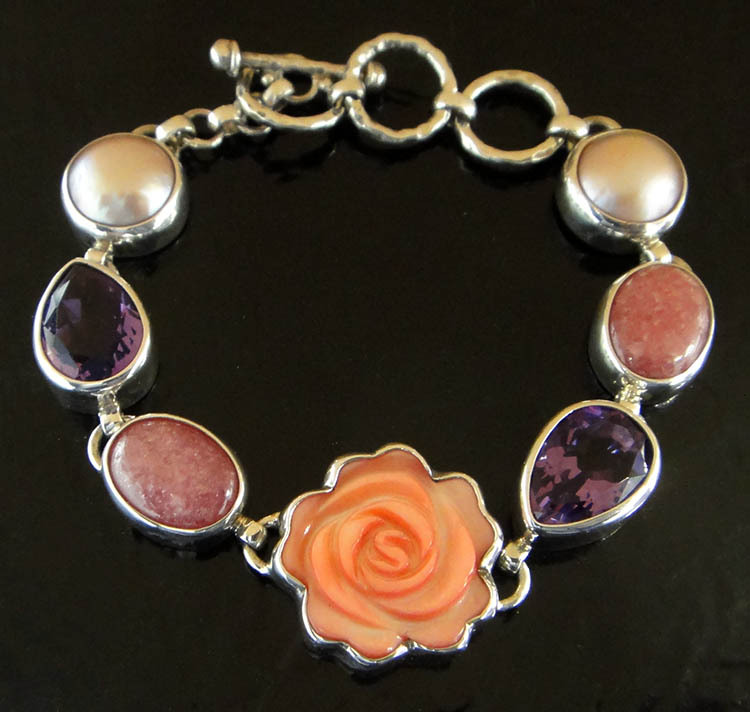 This bracelet would make a great gift for anyone who loves pink or purple, stone jewelry, or handmade sterling silver jewelry. This bracelet comes with our original store tags and gift box, great for giving or storage for years to come.